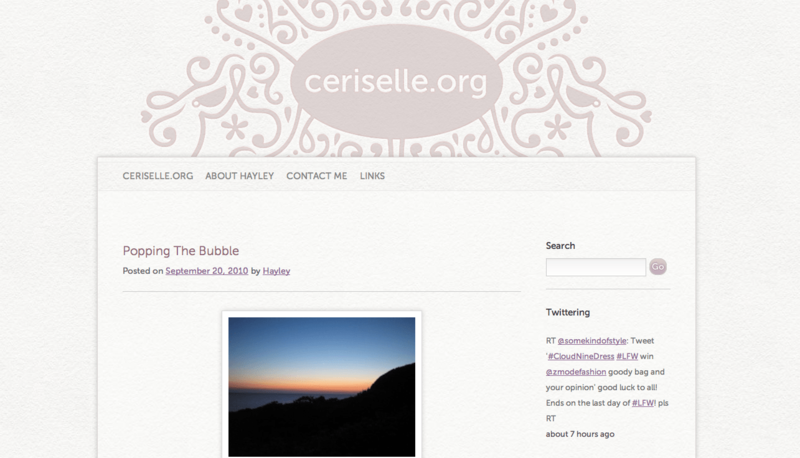 As some of the more observant among you (and those who saw Sarah’s quite frankly, brilliant spamming on Twitter last night) ceriselle.org finally has a new look, after so many years (not even a joke, ugh) of procrastination. I was getting annoyed with myself for always putting off a rehaul of the site, so asked Laura Kalbag to work her magic. We talk via Twitter quite a bit, so she knew the sorts of things I like. (Actually, is it really news to anyone who’s read my blog or followed me on Twitter to know I like tea and shoes? The new layout is much neater to me, and a lot of the crap that was lurking in the side bar has gone. Why did I need to have a full list of archive pages on the side? Why were the WordPress login info details there (when I have it bookmarked on every computer, know the URL, and have WordPress’ app on my iPhone and iPad?) It also means that I can have nice big images to show things off more! Now I have such a gorgeous site, there’s no excuse for not blogging. Oh. Sorry about that. I really love it! Boo to not having girly ones though. Maybe include a bit of pink or shoes in the next design. Check you out fancy pants!! Man I wish I knew how to fancify myself.